Perfect for all grooming uses. It can be used in the bathtub as well as on the grooming table. Constructed of durable cable, it does not absorb water, dirt or odors. It is made with brass, aluminum, and stainless steel hardware. Covered with a special soft cushion for comfort and protection, this tub choker will not rip, pull or irritate your pet's neck. It can also be used as a leash handle or a choke collar. Available in lightweight 30 and 34 heavyweight models. One size fits all. 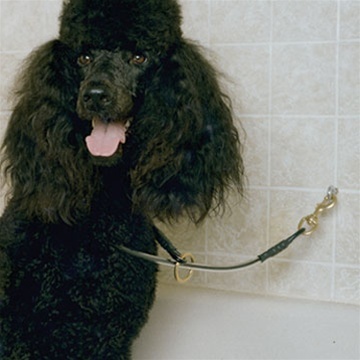 Cable tub restraint - 30" lightweight Cable grooming restraint - 21" lightweight Nylon choke style grooming noose - 36" Nylon grooming noose - 21"